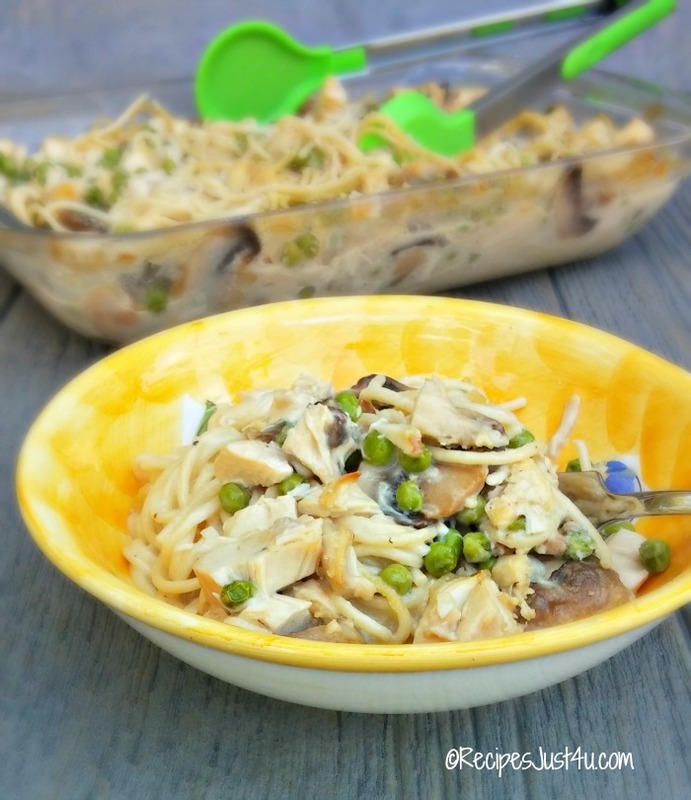 This decadent Chicken Tetrazzini with a wine and garlic sauce is rich and creamy and the whole family will love it. I’m in the mood for something hearty and rich tonight, and I happen to have a cooked chicken that needs to be used up. 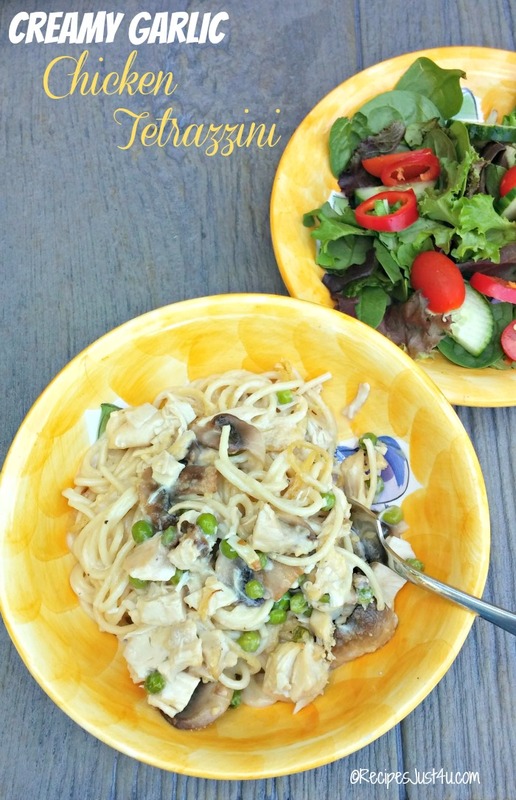 This chicken tetrazzini with a decadent and creamy white wine and garlic sauce is the perfect choice. Step right up folks, this dish is capital Y-U-M on so many levels. After all, we are talking about garlic and mushrooms and cream and chicken with a toasty cheese topping. What is not to like? I started to take something out of the freezer this morning to make for dinner and then realized that I bought a rotisserie chicken a few days ago planning on using it for lunches. Life changed plans on me and I ended up out for lunch a lot of days last week, so now I have this tasty chicken just waiting to be made into something luscious. 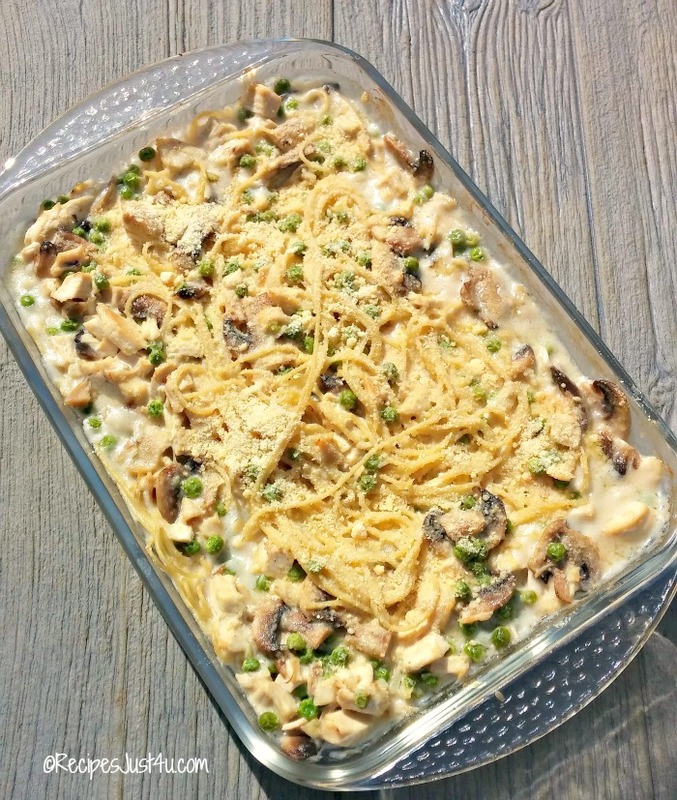 I’ve made chicken tetrazzini before by using cream of mushroom soup but today I wanted RICH, as in only heavy cream, butter and flour can make this sauce to satisfy me. These tempting looking ingredients are the base of my dish. i can’t wait to get started on it. Oh…and that wine looks good enough to sample, but I think I should rather let it go in the dish instead of in me, seeing as it’s only noon! Start out by cooking your pasta. I used 6 ounces for this recipe. That is less than you would normally cook for 6 servings but I like to use less pasta in a dish like this, since there are already lots of other calories with the butter, cheese and cream. I used Smart Taste Ronzoni for my spaghetti. While the pasta is boiling, cook the mushrooms and garlic and add the chicken to the pan and swish it around to get it all coated and yummy tasting. Let it rest on a platter while you prepare the delicious sauce. It’s important for the chicken to soak up the flavor of the garlic and butter for a while. I like a lot of garlic and my kitchen smells divine right about now. 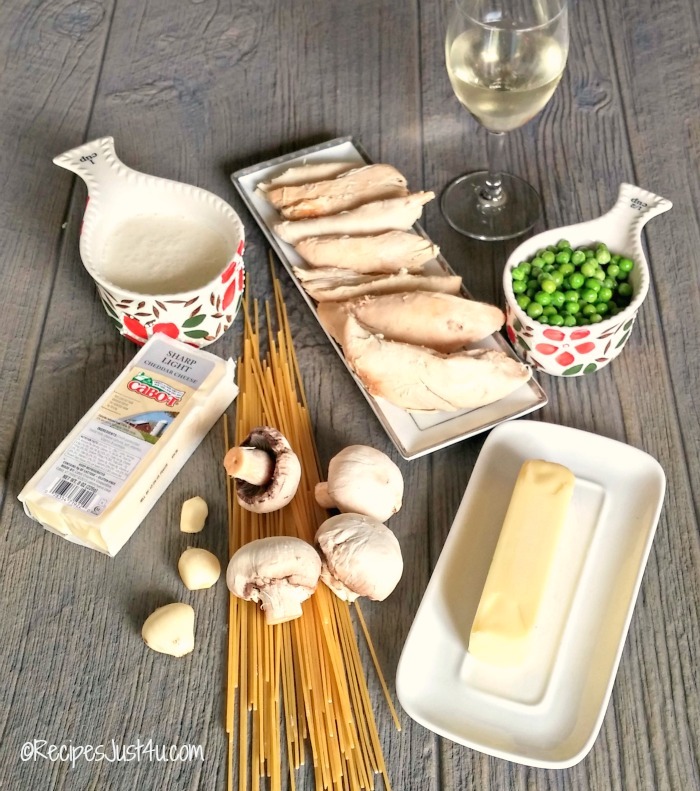 Butter….cream…peas..cheese….and wine…that’s what I’m talking about. 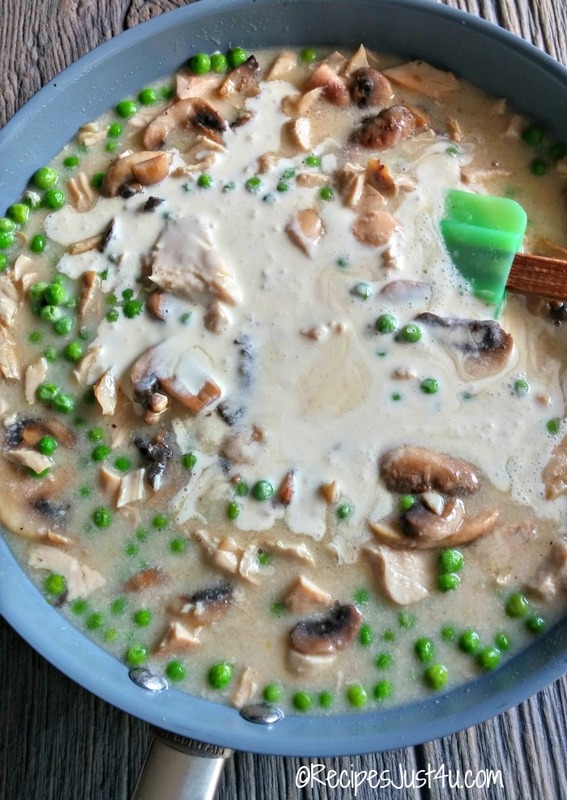 It comes together to make the most delicious sauce that is just itching to get added to the chicken and mushrooms. Be sure to add the cream last, after the sauce has thickened to a good consistency. The cheese that I chose for the sauce is a Cabot reduced fat cheese. 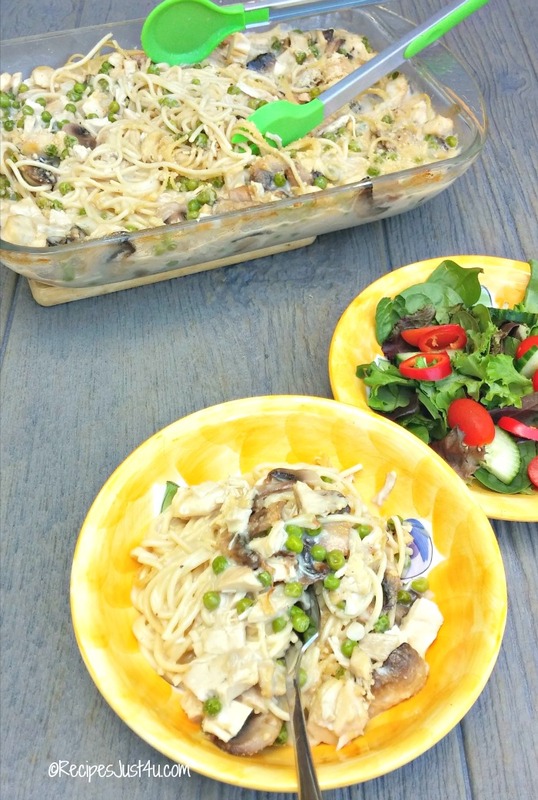 It has less calories but a lot of flavor and cooks well in a dish like this. Put everything into a large casserole, give it a good swirl. OMG. I can’t wait for this to cook. I want to eat it right now. Tie my hands will you? I am such a sucker for white sauces (just ask my hips…) It’s all I can do to not INDULGE right now. Add the parm cheese, and into the oven it goes for about 20 minutes until it’s bubbly and the cheese is sort of crusty and browned. Can you believe something so luscious is made so easily? Why used canned sauces when you can make THIS in just a few steps and in about a half hour? It is rich, creamy, so incredibly tasty. Perfect for any special occasion because you can do most of it ahead of time and just cook that last 20 minutes before serving. Add a tossed salad or some garlic bread and prepare for your family to be impressed! The flavor of the sauce is amazing. It is NOTHING like the ones I have made using canned soup. The butter and cream makes it. Seriously. Take my WORD for it. You will love this dish. What is your favorite way to use a rotisserie chicken? Tell us about it in the comments below! Preheat the oven to 350º F. Cook and drain the pasta, according to the package directions. In a large non stick skillet, melt 3 tbsp of the butter over medium heat. 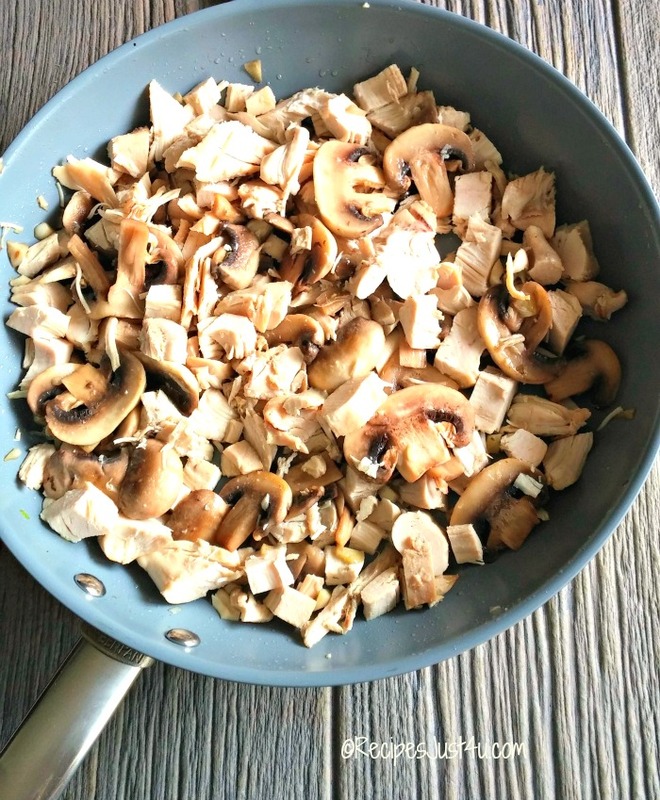 Add the garlic and the mushrooms, and cook for 3-5 minutes until they browned, stirring occasionally. Add the chicken, toss to coat well and remove from the heat. Melt the remaining 2 tbsp of butter in the saucepan. Stir the flour into the melted butter and slowly add the chicken broth and wine, whisking to combine. Increase the heat to medium high and bring the sauce to a simmer. Cook for 2 minutes, stir in the shredded cheese and thawed peas, stir well.. When the sauce starts to simmer, reduce the heat to medium, add the cream and let it cook on low, stirring constantly for 3 minutes. The sauce will thicken slightly as it cooks. Season it to taste with salt and pepper. 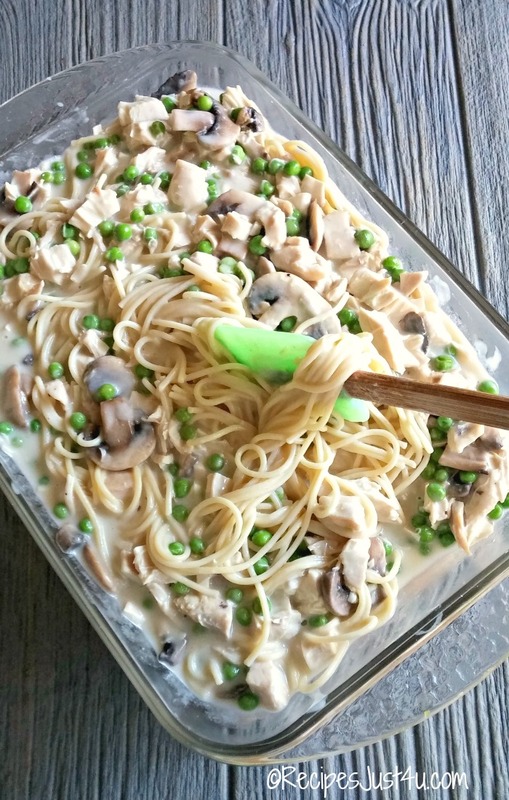 Place the cooked and drained pasta in a 9 x 13" baking dish and then spread the chicken mixture over top of it. Pour the sauce over the ingredients and stir to coat thoroughly, then sprinkle with the Parmesan cheese. Bake for 20 minutes, until the sauce is bubbling and the cheese has melted. Enjoy!